Union cuffs. These palladium cuff links are based on a partial section of our Union Jack flag. They are made as one-offs. Set entirely with diamonds, ( red diamonds, white diamonds and blue diamonds.) The design was inspired by a flag waving in the wind: The curve reflects this movement. At the base of each cufflink, there is a track of top grade, white diamonds, which gives extra sparkle to the pair. The underside of the union cuffs has a lattice design of the full Union Jack flag. It’s details like this, that set us apart from other designers. 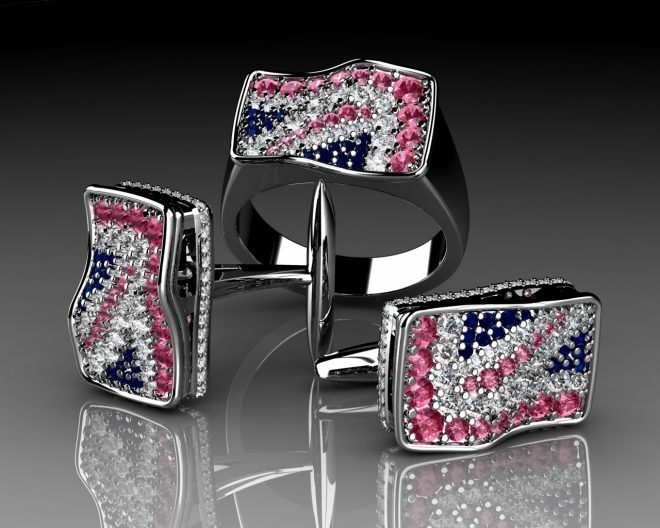 These cufflinks are completely unique and compliment the Union flag ring also on our site.